Right from the beginning, we must caution you that the content of this video is not appropriate for children. But with that caution made, we can also alert you to the fact that, once again, Roy lays bare some of the most extraordinary things you will ever see. If you’ve ever been curious about what it means to have an exorcism, you’ll be amazed at what you see here. Three different women ask Roy for his help. Within minutes those three women each have an exorcism. And they are fascinating. 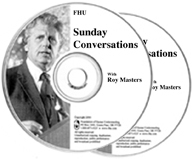 Roy Masters is not new to doing an exorcism, but what is special about this session is what you will see about yourself. We are in a time of great difficulty. Many of you realize that our very country is at stake. What Roy shares in these two hours can alter the future. You will also hear Roy reveal something about physics that even NASA hasn’t realized yet.